Swallow began to produce the Austin Seven Swallow car, built on a standard Austin chassis. After receiving an order for 500, and only being able to produce two a day, the decision was taken to move to a larger factory in order to expand production. The business moved to an old 40,000sqft. ammunition factory at Foleshill in Coventry, where there was plenty of space, a large skilled workforce on the doorstep, and in close proximity to the suppliers, which would reduce transport costs. The move was made late in 1928, and production increased to around 50 cars a week. Although the company still made sidecars, the name was changed yet again, to the Swallow Coachbuilding Company. Several new models followed, and the company began to build complete cars. Bill Lyons’ wanted the company to go public, but William Walmsley would have none of it. As a result he decided to let Bill Lyons buy him out, leaving Lyons in sole charge. By the end of 1934 1,800 cars a year were leaving the factory. As a result of the sale, the manufacture of Swallow sidecars transferred to Helliwell’s factory at Walsall Airport, where the company manufactured aircraft components. In November 1946 Swallow launched the successful "Gadabout" scooter, designed by Frank Rainbow, an aero engineer and industrial designer. Design work began in December 1945. The machine had a frame built from steel tubing, and was powered by a Villiers 9D 125 c.c. two-stroke engine, with a three-speed gearbox, and ducted air cooling. Unfortunately the engine could easily overheat and so the design was modified to include fan cooling. The machine sold for just over £99. 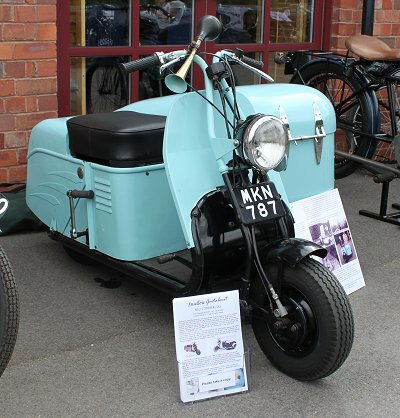 A new version was launched at the 1950 Motor Cycle Show, powered by a Villiers 10D 122 c.c. two-stroke engine, with a three-speed gearbox, and foot change. The fuel consumption was around 95 m.p.g., and the cruising speed was 30 m.p.h. It sold for £126.15s.3d. and was available in a variety of colours. 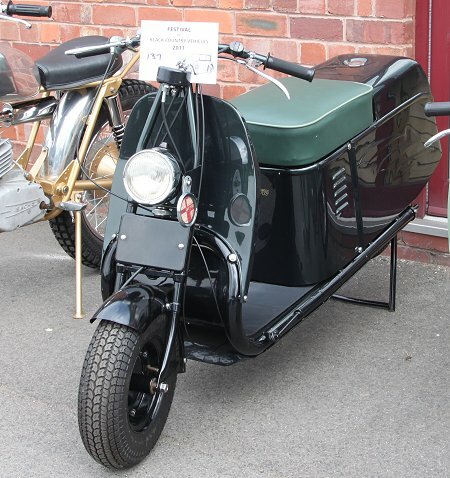 A version called the Gadabout Commercial was produced with a Swallow box sidecar, which was aimed at small tradesmen, and as a delivery machine for shopkeepers. It could carry 2 cwt, and sold for £115. 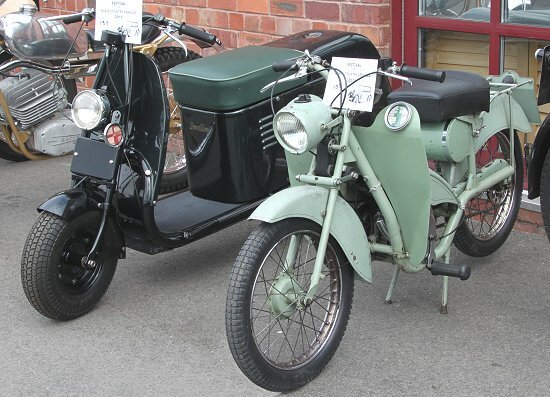 Versions of the Gadabout were used by Staffordshire Constabulary, and the Gas and Electricity Boards. 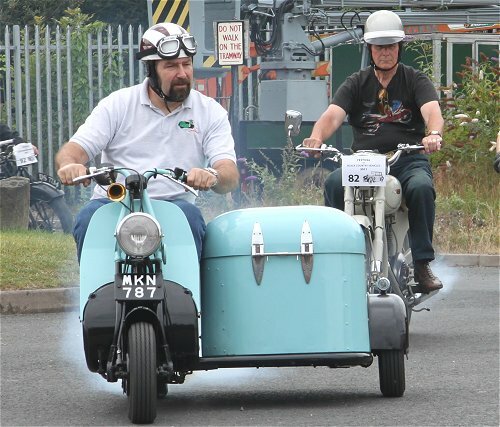 In the early 1950s Swallow faced increasing competition from the likes of Vespa and Lambretta, with which it could not compete. As a result production of the Gadabout ended in the early 1950s. Swallow continued to produce large numbers of sidecars, and the "Doretti" sports car. Production ended prematurely because of a management decision taken at Tube Investments, the parent company. Paul Webb's Gadabout from 1950. As seen at the Festival of Black Country Vehicles at the Black Country Living Museum, July 2010. 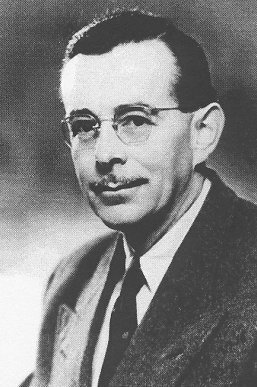 Paul Webb and his Gadabout Commercial from 1950. At the Festival of Black Country Vehicles, at the Black Country Living Museum, July 2011. Frank Rainbow also designed two prototype scooters, intended to be the successor to the Gadabout. The first, the Rainbow 'Sprite' was completed in 1950, and then redesigned as the Rainbow 'Joyrider'. The lightweight machine which weighed only 112 lbs. was intended for use as a short distance machine, ideal for ladies, particularly when out shopping. It was powered by a Villiers 1F 98c.c. engine, and had a top speed of 42 m.p.h. but never reached production. Mike Nagrave's Swallow Gadabout scooter, and Rainbow Joyrider. As seen at the 2011 Festival of Black Country Vehicles, at the Black Country Living Museum, Dudley. Another view of Mike Nagrave's Swallow Gadabout scooter.